The gun used in the slaying of a woman last week on a popular San Francisco pier belonged to a federal agent, law enforcement sources close to the investigation told NBC News Tuesday. 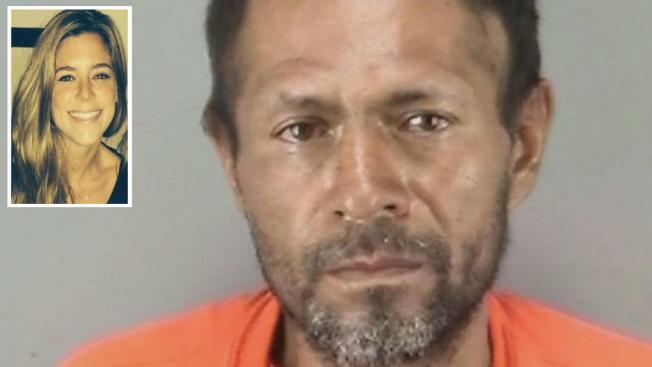 Sources could not immediately say how Francisco Sanchez, the undocumented immigrant charged in the fatal shooting of 32-year-old Kate Steinle, obtained the weapon. The firearm, described as a large-caliber handgun, was left inside a vehicle from where it was stolen, the sources said. Sanchez, identified fully in court documents as Juan Francisco Lopez-Sanchez, made his first court appearance Tuesday during his arraignment in Superior Court and pleaded not guilty to murder charges related to the shooting death. Sanchez is being held on $5 million bail, though prosecutors had argued for $10 million. His next court hearing has been set for July 22. Standing at Sanchez's side along with a Spanish-speaking court interpreter, Matt Gonzalez, a public defender representing Sanchez, told the court there is a high probability that the shooting was accidental. Court documents show the Pleasanton resident was shot in the back on July 1. The complaint filed against Sanchez by San Francisco District Attorney George Gascon, however, states Sanchez "willfully, unlawfully and with malice" murdered Steinle along Pier 14 as she was walking with her father. "This was an act of random violence, shooting an innocent victim in the back,'' prosecutor Dianna Garcia told the judge, arguing against releasing Sanchez on bail. A downcast Sanchez spent most of the hearing with his head bowed, appearing to fight back tears while the judge explained the charges to him. Outside court, his attorney said Sanchez has a second-grade education and a nonviolent criminal record of low-level drug arrests and immigration violations. He faces life in prison if convicted. Sanchez's criminal history dates back to 1991, mostly for drugs, including heroin, and sneaking into the United States, sometimes fewer than 30 days after he was deported Mexico, federal records show. A federal database has logged Sanchez's past convictions and deportations, with at least 40 entries in its system over the last two decades. In jailhouse interviews, Sanchez said that if he killed her, he didn't remember much because he was high on marijuana and sleeping pills. San Francisco prosecutors on Monday charged a 45-year-old undocumented man from Mexico with the murder of a young woman strolling along the pier with her dad in a case that's sparked a national debate about immigration policy. Francisco Sanchez should be in court on Tuesday afternoon. Stephanie Chuang reports. Aside from Steinle's case, the most violent crime Sanchez was arrested for was for assault in Arizona in the 1990s, though he has not been convicted of that charge. Records also show that he was deported on five occasions back to Mexico – the first time in 1994 – and on one occasion sneaked back into the United States within a month of being deported. His legal status, and the fact that he kept sneaking back to the U.S. and that he wasn't turned over to immigration, has been a point of national debate. Sanchez was last sent to prison by the U.S. Attorney for the Western District of Texas on a charge of re-entering the United States after being deported. On March 26, he was released from the federal Bureau of Prisons, and turned over the San Francisco County Sheriff’s Office because he still had an active criminal warrant for felony sale of marijuana, federal records show. On March 26, ICE lodged an immigration detainer asking to be notified when he is released. On April 15, the jail released Sanchez without notifying ICE, because the city and county are sanctuary cities, and do not help the federal government deport immigrants. According to ICE, last year the agency lodged 161,322 immigration detainers in the United States, and 36,284 in California in 2014. Between January 1, 2014, and June 19, ICE records show there have been 10,516 detainers declined in California and 17,193 detainers declined nationwide. Unknown date – Sanchez illegally entered the United States without admission or parole. 5/13/1991 – Sanchez convicted by an Arizona state criminal court of inhaling toxic vapors - sentenced to one month in jail and up to five years probation. 2/2/1993 – Sanchez convicted by Washington state criminal court of felony heroin possession - sentenced to 21 days in jail. 5/12/1993 – Sanchez convicted by a Washington state criminal court of felony manufacturing narcotics – sentenced to nine months in jail. 11/2/1993 – Sanchez convicted by a Pierce County, Washington, criminal court of felony heroin possession - sentenced to four months in jail. 6/9/1994 – Sanchez convicted by a Multnomah County, Oregon, criminal court of misdemeanor imitation controlled substance - ordered to pay a fine. 6/10/1994 - The former Immigration and Naturalization Service arrested Sanchez and placed him in removal proceedings as an alien who’s been convicted of a controlled substance violation and an aggravated felony. 6/20/1994 – An immigration judge ordered Sanchez removed to Mexico. On the same date, INS deports subject to Mexico. 7/14/1994 -Arizona state criminal court revoked Sanchez’s probation – sentenced to 93 days in jail. 7/11/1996 – Sanchez convicted by Washington State criminal court of felony possession of heroin - sentenced to 12 months and one day in prison. 3/12/1997 - INS arrested Sanchez on an “order to show cause,” charging him as “deportable alien” based on his illegal entry and aggravated felony conviction. 4/1/1997 –Immigration judge ordered Sanchez removed to Mexico. 4/4/1997 - INS removed Sanchez to Mexico. Unknown date – Sanchez illegally re-entered the U.S.
7/22/1997 – Sanchez arrested by Arizona law enforcement authorities for assault and threatening/intimidating. The final disposition of this arrest is unknown. 1/13/1998 – Sanchez arrested by U.S. Border Patrol. 1/15/1998 – Immigration judge orders Sanchez removed. 2/2/1998 – Sanchez deported to Mexico. 2/8/1998 – Sanchez arrested by U.S. Border Patrol after illegally re-entering. Border Patrol seeks criminal prosecution for felony re-entry. 9/3/1998 – Sanchez convicted in U.S. District Court of re-entry after removal – sentenced to 63 months. 2/20/2003 - U.S. Bureau of Prisons turned Sanchez over to federal immigration. 3/6/2003 – Sanchez removed to Mexico. Unknown date – Sanchez illegally re-entered the US. 7/4/2003 – Sanchez arrested by U.S. Border Patrol in Texas – presented for prosecution for felony re-entry. 11/7/2003 – Sanchez convicted of re-entry after removal and violation of supervised federal release - sentenced him to 51 months and 21 months respectively. 6/29/2009 – Bureau of Prisons turned Sanchez over to ICE for removal. On the same date, ICE removed him to Mexico. 9/20/2009 – Sanchez arrested by CBP in Eagle Pass, Texas, and he was presented for prosecution for re-entry after removal. 10/14/2009 - U.S. Attorney for the Western District of Texas filed indictment for re-entry after removal. 9/10/2010 – Sanchez charged for violating his federal probation. 5/12/2011 – Sanchez sentenced to 46 months in prison and 36 months of supervised release for the re-entry and probation violations. 7/13/2011 – ICE lodged immigration detainer with the Bureau of Prisons. 10/9/2013 - ICE’s Southern California Secure Communities Support Center lodged an immigration detainer with the Bureau of Prisons. 3/26/2015 – Sanchez released from prison custody and turned over to the San Francisco County Sheriff’s Office to an active criminal warrant for felony sale/furnishing marijuana. Bureau of Prisons transferred him directly to county jail upon his release. 3/27/2015 – ICE received automatic electronic notification indicating Sanchez had been booked into jail custody and lodged an immigration detainer asking to be notified before his release. Unknown date – Jail did not honor the immigration detainer and released Sanchez from custody. ICE is not notified of the release. 7/3/2015 - ICE received electronic notification indicating Sanchez had been booked into San Francisco jail and lodged an Immigration Detainer – Request for Voluntary Action.